Monthly Market Update: What’s In and What’s Not in the Turkish Pazars, Plus All About Meyer Lemons! This wild weather hasn’t bothered me in the slightest: under doctor’s orders to stay inside and rest, I have had a great afternoon on the computer learning all about Meyer lemons! The markets right now are full of predictable winter vegetables but the overriding stars are the huge mounds of glorious citrus fruits: it’s a celebration of citrus! They are at their height. 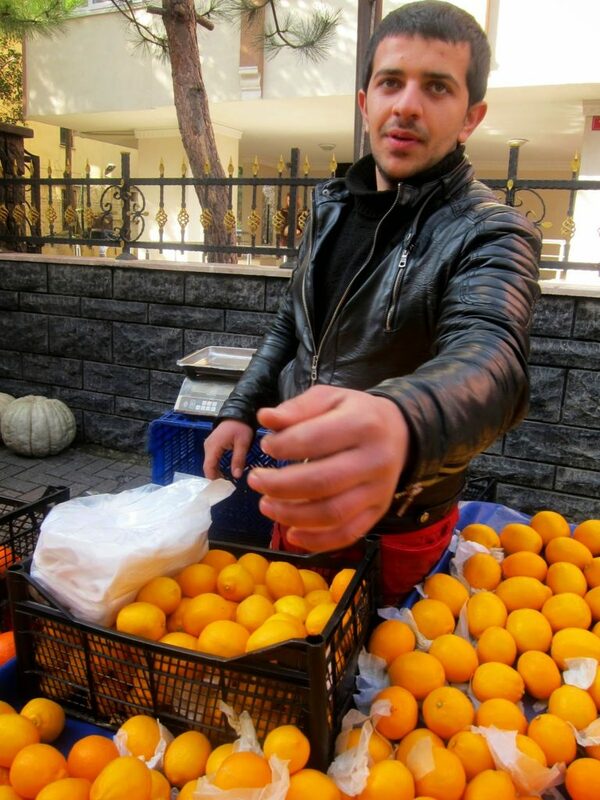 I mean, just look at this amazing selection of mandarines from Izmir ‘very sweet’. Back to Meyer lemons: I have never heard of them before. Have you? If you are American, the odds are higher that you have, especially if you hail from California, state-grower extraordinaire, along with Florida, of citrus fruits. not meyer but fulllll of juice/boooool suyu! thin skin/ince kabuk – so says the sign anyway! Eski means ‘old’. I owe my miraculous enlightenment to friend Lale who just by chance mentioned these lemons the other day, adding darkly that ‘Turks don’t like them’. I was intrigued. now, he is selling meyers but not openly proclaiming it: can you see how the shape and colour are different? But I have since been to the market, found them, and can indeed now tell them apart from regular limon. 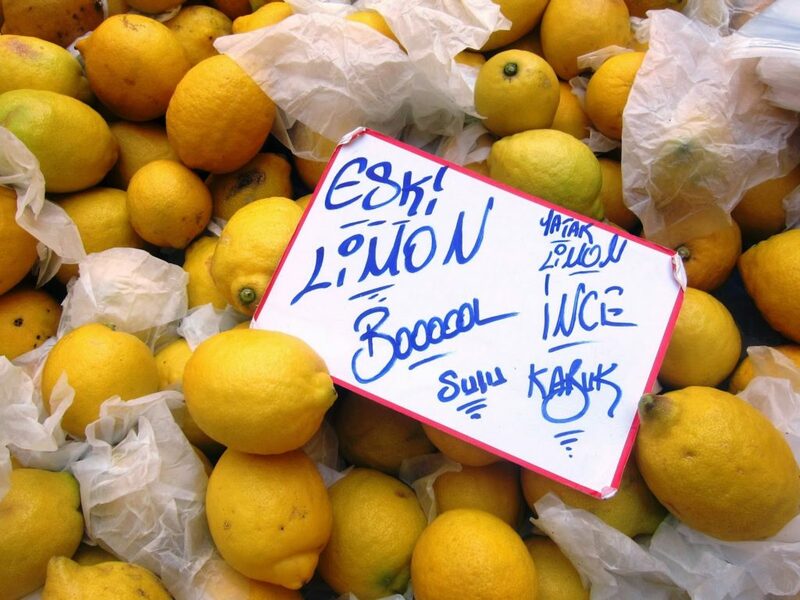 And sure enough, the market sellers don’t trumpet ‘Meyer geldi ‘ or anything like that, and when I asked if the lemons they were selling were this variety, they only sheepishly admitted they were. So now I can converse intelligently on this species of the citrus family and am bursting to share some facts (and links!) with you! Meyer lemons were introduced to the US from China by Frank N. Meyer, an ‘agricultural explorer’, as long ago as 1908. They are a cross between a lemon and either a common orange or a mandarine, with a thin, fragrant skin, and are yellower, juicier and less acidic in flavour than a regular lemon. As a result they can be eaten whole and used in all manner of ways. The season is right now so hustle off to your local pazar and track them down! ‘So carpe that diem, diners, and get your mitts on some meyers’! Love it! The popularity of these citrus fruits apparently owes a lot to culinary legends Alice Waters from Chez Panisse, and Martha Stewart when they started featuring them in their recipes. Read these articles and become a ‘meyer junkie’ as one of them puts it – like me! 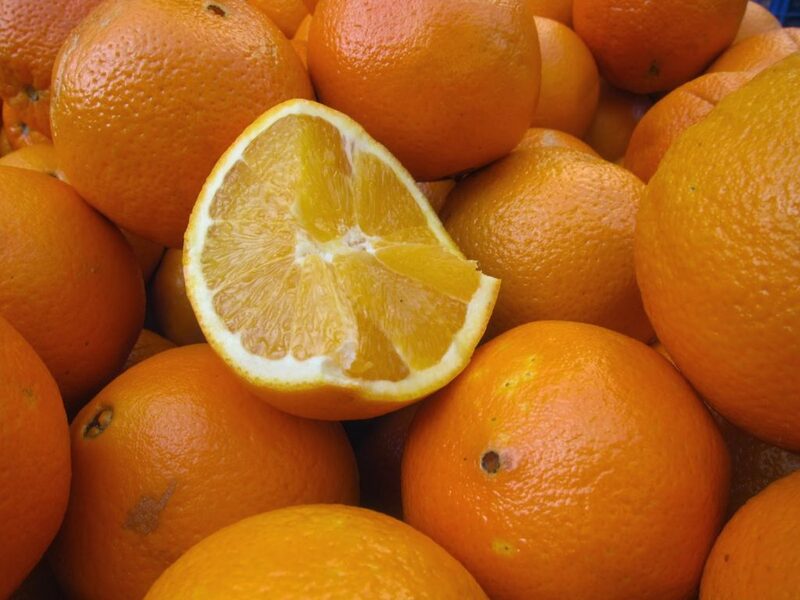 5 Facts about oranges that I bet you didn’t know! The colour orange was named after the fruit. The first recorded usage in English was as early as 1512. Brazil is the world number 1 in terms of orange production (18.0 million tonnes) (2012) with Turkey ranking 9th (1.6 million tonnes). Just in case you’re wondering, South Africa is number 10. Oranges must be mature when harvested. They cannot ripen internally post-harvest although they may de-green (turn orange in colour) externally. 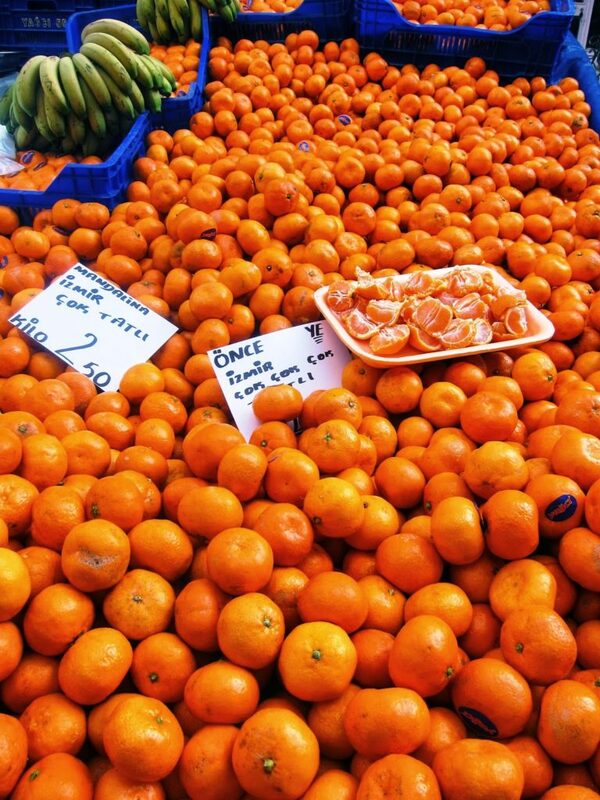 Oranges can be stored for up to 12 weeks after harvest by refrigeration in controlled-atmosphere chambers but should be displayed on non-refrigerated shelves. Oranges are, as we know, rich in Vitamin C and don’t spoil quickly. As a result, Spanish, Portuguese and Dutch sailors planted them along routes to prevent scurvy during the Age of Discovery. In the markets, interestingly enough, I didn’t see any of those huge pomelos – I only see them in selected greengrocers and they don’t appeal. They are relatively new on the scene. Otherwise there are grapefruit but it is the mandarines, the satsumas and the oranges themselves that are available in such abundance in the markets right now. If you look at wikipedia, you will see the wide number of hybrids and cultivars that exist worldwide. If I can tear myself from citrus, what else should we look out for in the pazars right now? I notice that the persimmons/trabzon hurması have disappeared until next year. Quince/ayva are still widely available. 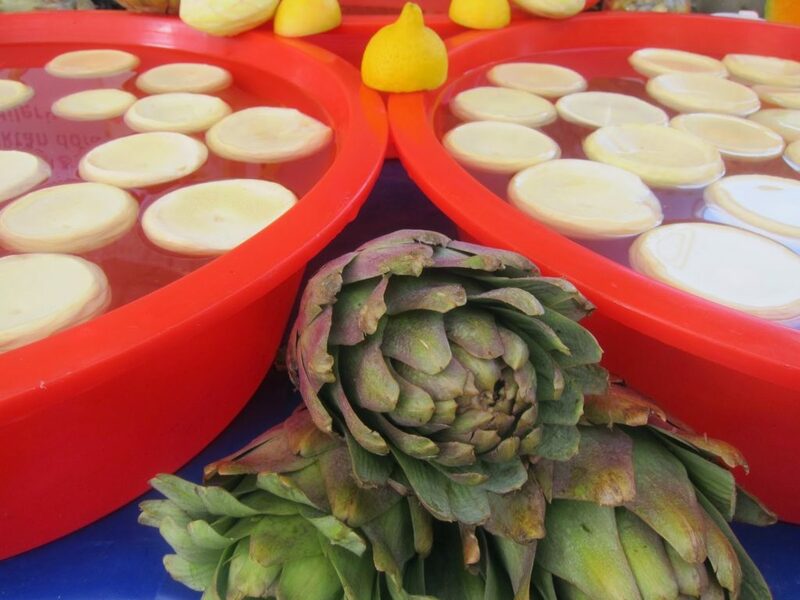 I actually saw some fresh artichokes/enginar being prepared – surely this is too early for the new crop? 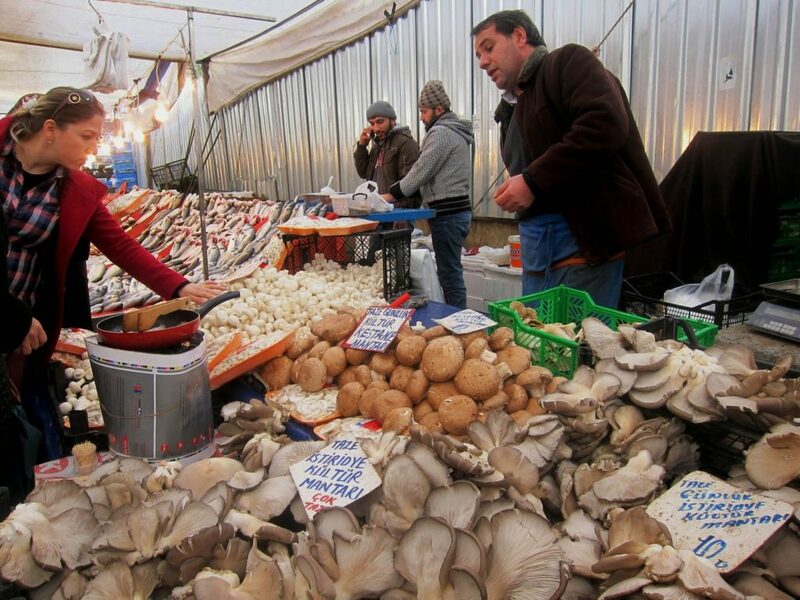 I actually went to a different market than my usual Selami Çeşme one: this one was the weekly Erenköy pazar. It was big and sprawling: long streets covered with tarpaulin in case of rain, fruit, vegetables, clothing, textiles: you name it. But I missed my usual crew, ‘my’ guys, so not the same experience. 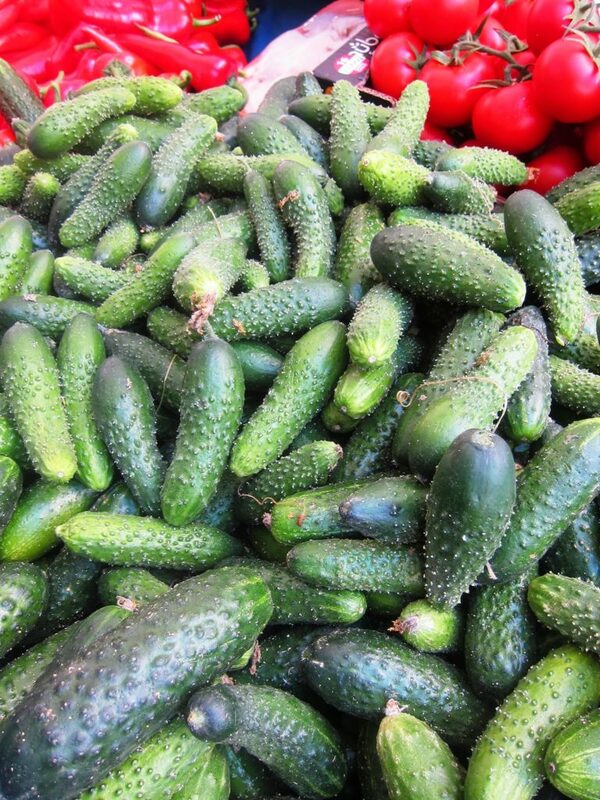 I asked if they were for pickling but apparently not: they are just regular cucumbers which are kıtır/crunchy to the taste! I wasn’t tempted. This is possibly only of interest to me and anyone else who has been here a long time and remembers when mushrooms were scarce. For dinner parties we had to have a Plan A and a Plan B: with mushrooms and without. And that was only the one variety.It was all a function not only of agriculture but also of road systems and transportation. Many sorts of fungi grow out in the countryside but they never made it to the cities in those days. And finally there is one item of produce that if you like it, buy it from the markets as they are much cheaper: avocados. These are not typically Turkish at all and in fact only appeared on the scene in recent years. Many of my Turkish friends are still not fully acquainted with how to use them. Typically avocados are sold as hard as a brick but after 3-4 days, left out of the fridge, they will soften up beautifully. Sold singly, they cost 2½ liras but if you bargain for 5 for 10 liras, the vendor will almost certainly oblige. In the regular manavs, they cost 3 – 3½ liras each.